The Clematis collection amassed by Brewster Rogerson lives on, thanks to the support of numerous volunteers and donors. Having found its permanent home at Luscher Farm in Lake Oswego, the Rogerson Clematis Collection is now displayed throughout the onsite gardens, including here at the entrance to the property’s historic farmhouse. In 1971, when Kansas State English professor Brewster Rogerson bought four Clematis plants, little did he realize what those plants would inspire not only in him, but in gardeners throughout the United States. Brewster’s original intent was simply to buy some flowering vines to grow on a trellis he had in his garden. But being the inquisitive type, and especially since he liked the plants, he began to seek out information on Clematis. There was little he could find, but that did not stop him from buying more. By 1975, he had acquired a sufficient number of plants that he considered himself a collector. Once Brewster retired from his teaching position, his passion for Clematis continued and he decided to move to a climate more hospitable for growing them. He initially settled in Eugene, where he became involved in plant organizations. It was through his involvement with the Hardy Plant Society of Oregon that he met Bob Gutmann from Gutmann Nurseries. This meeting proved pivotal in the continuing development of Brewster’s collection, because Bob Gutmann offered him greenhouse space for his Clematis plants, which now numbered more than 100. All Brewster had to do was help write the catalog for Gutmann Nurseries and assist Bob in selecting new Clematis varieties. In exchange, he could have an 18-by-90-foot greenhouse for his plants, all the potting soil he needed and a continuous supply of one-gallon cans — for the grand total of $20 per month. It was an offer Brewster could not and did not refuse. What is even more amazing is that during the 15 years the plants were at Gutmann’s, that price never changed. The Clematis collection continued to grow, but unfortunately, Brewster developed macular degeneration and was unable to take proper care of it. By this time, a group of volunteers had come together to help with the general maintenance, but it became obvious that the collection would have to be moved. The primary problem was where to move it. A committee was formed to find the collection a new home. Members decided to contact those places where it was possible that the collection would have a welcoming permanent home with additional growing space. I was on the committee. It was so discouraging to be told “no” every time. We talked to the Oregon Garden, the City of Portland, Portland Public Schools Green Thumb Program, Jenkins Estate, Hoyt Arboretum, Clackamas Community College and McMenamins. None worked out. At the last scheduled committee meeting, it was decided that if there were no new developments, the plants would be sold piecemeal and the collection dissolved. As the meeting was ending and we were getting ready to leave, I mentioned to the committee chair, Linda Beutler, that I had a relationship with a contact in the City of Lake Oswego. Perhaps I could ask him if there was any interest. My contact was Jerry Knippel, special projects manager for Lake Oswego. At the first meeting with him, he muttered, “That’s doable.” I was so surprised at his response that I was not sure I had heard him correctly, but then he repeated the phrase. A week later, we met again. His answer had become not just “That’s doable,” but “I think I have a location for it: Luscher Farm.” By this time, Kim Gilmer, director of parks and recreation, and Mayor Judie Hammerstad entered the picture. Both were enthusiastic about the project. Luscher Farm is a 43-acre former dairy farm and farmhouse that first appeared on the tax rolls in 1900. The property had been donated to the city with the stipulation that the house be maintained as it was and that at least 23 acres be farmed. What happened next is quite remarkable, as the project rapidly progressed. In November 2004, the collection was in danger of disappearing and by the end of January 2005, the City of Lake Oswego had said “yes” with three conditions: an antique rose garden would be built around the old farmhouse, an area under the 115-year-old beech tree would become a backyard bird habitat, and an antique apple orchard would be re-established. Before any Clematis plants could be moved, the property needed to be graded and the land prepared. Then volunteers put up a 48-by-30-foot greenhouse. On December 3, 2005, 900 Clematis plants (450 species and cultivars) were moved from Gutmann Nurseries to Luscher Farm. This was all accomplished with volunteers from the gardening community who continue to maintain it. In July 2007, Linda Beutler became the curator of the collection and she maintains that position today. Under her stewardship, the farmhouse and gardens have been transformed. Someone who last visited the farm 10 years ago would not recognize it today. All of Brewster’s plants, which include 735 species and cultivars and a total of more than 1,600 plants, are planted. However, 1,600 Clematis plants does not mean 1,600 trellises, because many of the plants are using other plants for support to give home gardeners ideas on how to use combinations in their own gardens. The collection has specific areas such as the Heirloom Garden, the Front Bank, the Baltic Garden, the Polish Beds and the Founders’ Garden. There is an interesting historic fact related to the section named the Baltic Garden. When the Berlin Wall was erected during the Cold War, Clematis plants were being bred in Eastern Bloc countries. This was largely unknown to western gardeners. When the wall came down, Clematis plants came tumbling out. Currently the garden is utilizing an area to the right of the driveway to plant newly introduced Clematis in rows on fences, like a test garden. The garden is also the most comprehensive Clematis collection in a public garden in North America, and Oregon’s only all-organic ornamental public garden. The garden is open from dawn to dusk and visitors are welcome. The Rogerson Clematis Collection has introduced many selections to our Northwest gardens that were not previously known. When I visit garden centers, I am seeing more and more Clematis varieties available to the public and there is an increased interest in these plants. Gardeners are learning that Clematis is much more than “that vine that flowers in the spring or summer.” Not all of them are vines. Some will act as a ground cover or as a creeper through other plants. The Rogerson Collection has given much back to the community and it would not exist if many volunteers had not given hours of their time to make this come to fruition. Thus, once again the act of gardening has brought people together. What a wonderful way to end this year and begin another, with the knowledge that this treasure we almost lost is now celebrating its 10th anniversary. 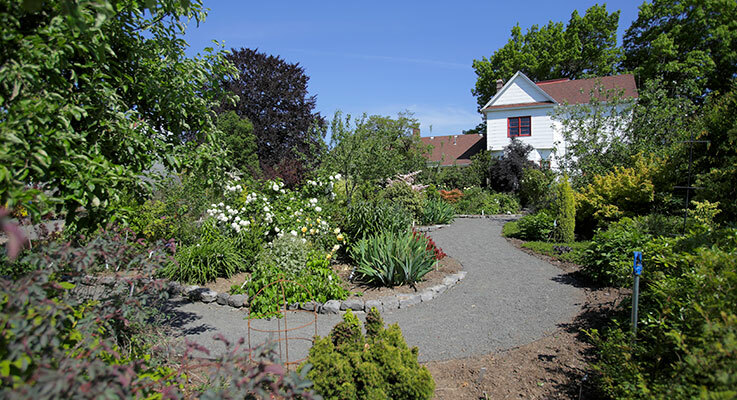 The Rogerson Clematis Garden is located at Luscher Farm (125 Rosemont Rd., West Linn, OR 97068). The garden is open to visitors every day from 8 a.m. to dusk. The greenhouse (staffed with volunteers) is open Fridays from 10 a.m. to 2 p.m. and the fourth Saturday of every month from 10 a.m. to 1 p.m.
For more information, go online at www.rogersonclematiscollection.org.